I am more than glad to write a testimonial for your school. After being unemployed for more than 18 months, and the fact that the retail industry was not hiring store managers, I decided to look for another industry to work in. My dad always told me “you should have a ‘Trade’ you can always fall back on”. Well at the age of 52 I took his advice. I love working with animals, and as once being a Store Manager for a pet store with a grooming salon, I believed that pet grooming was going to be my trade. I did a lot of research for grooming schools in the Western United States. Since I live in Lake Havasu City, Az., I knew that I was going to live where the school was located because there were no schools in my city. I look at schools in Las Vegas, Nv. Phoenix, Az., San Diego, Ca. and several schools in the Los Angeles/Inland Empire area. I look for what the school was going to offer me as a student, and your program was the best and most affordable. Here is what I liked about your school and program. Your classes were very hands on, students work with pets the ever first day of class. Not after several weeks learning from a manual or from an instructor lecturing on techniques as some of the schools were teachings. The classes started when I needed them to start, and the class sizes was small. (In my class there were only three to five students.) This was important because of the ‘One on One’ training the students received. Also your instructions were based on the student skill level. You adjusted the course schedule to fit the student needs. In my case, I had some training before coming to the class and was clipping by the end of the first week, where one of the other student needed a little more time to get the bathing technique down and you gave that to him. The cost of the class was very affordable and you worked with the students on payment plans. Some of the schools I found were very over priced for what appeared the student was getting for the class. The length of the course was perfect for what a new groomer needed to start working in the field. 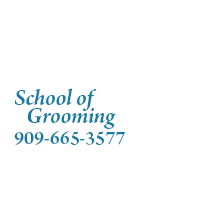 My research show that a groomer needs more than four weeks of training (which is what two of the schools were offering) to be able to find a job (as a groomer) in the Los Angeles area. Most of the salons wanted the full twelve week course or 560 hours. Nancy on a personal note, you and your staff made the whole experience of learning fun and enjoyable. I wanted to come to school every day and learn everything about grooming and pet care. You also gave me the confidence to pursue my dream of opening my own shop next year. But for now, I’m working in the top pet salon in Lake Havasu as a groomer to improve my skills and speed. Thanks for taking the time to answer all my questions about opening the business. 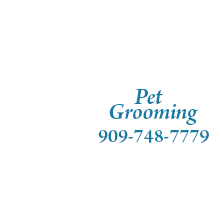 You have a wealth of knowledge from your thirty years of experience in the pet grooming industry. Again, thank you and your staff very much; you might not know how much you have changed my life. I’m starting to get my life back under control after 18 very long months. I Highly recommend the 'West Paws" training program for Pet Grooming. My name is Barbara Marcotte, I attended this program in 2005. Briefly, I worked 20 yrs. in manufacturing, and computer service department for Northrup Gumman. Getting laid-off in 2005 turned out to be a good thing for me, it gave me the opportunity to do something I've always wanted to do; work with animals. I have always LOVED animals. I called a few training schools, and after meeting with Nancy, West Paw's instructor, for an interview/orientation, I knew this is where I wanted to be. Nancy made me feel very comfortable. To touch on only a few of my experiences in-training; Nancy taught me the proper way to handle and maintain my tools and equipment, showed me step-by-step detailed grooming procedures, and then, one-to-one hands-on-training. She was their with me showing me better and easier ways to cut, trim, style and even handling the pet I was grooming. She did encouraged me, and gave me confidence in my work. I'll never forget this training class, we had lots of fun throughout the training course, especially when we were Mobile grooming. After a couple of months of training I was confident enough, with Nancy's help, to start my own grooming business. My husband and I bought and older Van, we stripped it out and converted to 50th style Mobile grooming van. It's not one of these new, large, fancy vans, but I really like it, it's very personal to me and my customers like it, and that's what counts. This was the first time my husband attempted anything like this, and he only had weekends to work on it, so It took us about six months to complete the van. I started Grooming the first of the year 2006, my business boomed. While we were still converting the van people were knocking on my door wanting my services. Within a month, I was pretty well booked up, working 6 days a week, with a waiting list of over 40 pets. I currently, 2010, only work 4 days a week know and still getting calls nearly every day. Word of mouth from my clients, and my van advertisement is the only way I've advertised, I have never advertised in the paper or phone books. It's hard work but I'm still enjoying it very much. The Grooming Business is Good Business. My Business name is "Cookies Splish Splash" I'm taking a bath. My name is Anastasia and I was an accountant before coming to America. I came 5 yrs. ago and I wasn't having any luck finding any work that was fulfilling, so with encouragement from my husband, I enrolled in West Paw in July 2009. English is my second language and I am insecure about my speaking ability, but Nancy had so much patience with me and she trusts me more than I do myself.... It was hard, but she showed me when I did not understand, and encouraged me to talk with people, even when I didn't want to. Thank you for this training, Nancy. You made from me not just a groomer, you help me to grow as a person. Since the graduating and till now we are very close. Nancy, you have changed my life so much, thanks for everything. I have always been passionate about animals and always wanted to work with four legged friends. It seemed a veterinarian would be the best choice but i knew i would never have the guts to do what they do on the daily. I dabbled in different fields of work, always dreading another day on the grind and sometimes a position would grow on me and i would be content for a while. On such occasions i ended up laid off or stuck doing something i was good at but had no desire or interest in. This is where i made a decision that changed my life forever. I ended up looking for anything related to pets and pet care... how cool would it be to mess with furry ones all day and get paid for it? After doing some research online and speaking with family and friends i looked into pet grooming, searched my area, and found west paw school of dog grooming. I spoke to Nancy and made an appointment to check everything out. i was excited from the start, the shop, cool equipment, state of the art classroom, good people, i honestly loved every second of the roller coaster ride through training. We were doing hands on work from day one. i had a dog on my table within the first twenty minutes of my first day! i also received all of my own equipment within the first thirty days. i was able to do every aspect of grooming, from breed clips to severely matted strip downs to creative mo hawks with color. i did it all while enrolled at west paw. After graduating i was offered the opportunity of a life time... to work side by side with Nancy in the classroom; as her assistant and head groomer. I was even able to assist with teaching, but the part i think helped the most was the experience itself. By this i mean the general ability to shadow a successful business owner and to run an actual shop. Let me say this, it was never easy and i was constantly challenged. At this time we were doing 20dogs or more a day... on a slow day. I would collapse when i got home; so tired from the long days, but i was growing and changing as a person, and that's a wonderful feeling. Since venturing beyond west paw and the sturdy wings of my instructor, i have acquired two long term positions (both shops owned by previous west paw students) and have had no gaps in employment. No matter how this economy is, people will always provide for their pets. So where am i at today? The changes within my self and in my daily life, from 2005 before i picked up the phone to enroll, to today; are so extreme it leaves me in constant awe with gratitude and with the gift of being permanently blessed. I now own my own business and have my own employees. My business partner; Sophia (who also graduated from west paw a year before me) and i are thriving. my little "woofs n wags mobile" dream is now A reality and my only issue is not being able to supply all my clientele. My next step is to expand my business and get my self a fleet of mobile units. I am thankful every day for everything west paw did for me and i speak with my ''once teacher now friend', Nancy, on a weekly bases. Because of this drastic shift in my yearly earnings, i am also able to support my family solely while my husband now goes to school. My monthly income has tripled in the last four years. How amazing life is when you are in your calling! None of this would have ever been possible without that one little thought in the back of my mind, the decision, the opportunity, and that first phone call. P.S. Some of the best groomers around come from west paw, I'm lucky, proud and honored to be one of them ;) thank you again Nancy,for everything! Hi! My name is Jin-sook Lee from South Korea. As I was searching for a new adventure in life 12 years ago, I ran into a TV show which introduced Interesting occupations in the world. That particular episode was all about dog grooming, presenting West Paw School of Dog Grooming as a model. That rang the bell in my head and I decided to contact the school to join the program. I flew to the US and that was the open chapter of my new adventure just beginning to unfold. There I met Nancy, the wonderful teacher and the great mentor, who taught me to become a dog groomer. Had it not for her sincere heart and passion towards animals and students, I would not be what I am now. Looking back the time I was a student at West Paw, it was an excellent opportunity to be able to meet various kinds of breeds and to have hands on experience on them. The teachings and experiences at West Paw has become the foundation of my knowledge and techniques in dog grooming. I now operate my own dog grooming business in California, and it has been a great success even through this tough time of recession. Thank you Nancy, Thank you West Paw School of Dog Grooming. My name is Tara O'Rourke and I am a 47 years old and I now make a living as a mobile pet groomer here in the Inland Empire. One year ago this month (AUGUST), I graduated as a certified pet groomer and I now own my own mobile grooming business. One year ago I was still in the same rut I had been in for the majority of my adult life which consisted of no job, no valuable skills to even obtain a job, living with a man I really wanted away from but I had no way out. He supported me and I had not one skill to offer the work force. Besides having zero self respect or self worth my days were spent being lazy all alone while everyone else participated in life. You know going to lunch, shopping and working, paying bills, sitting in traffic and all with self respect because the bills being paid were from money earned making a living. That's all I had ever wanted to do was be a participant in society doing life on life's terms. Living pay check to pay check sounded wonderful as long as it would be my pay check. Instead I never accomplished anything but taking my daily anti-depressant and my nightly sleeping pill and blaming my whole life on everyone but myself. I was miserable and realized I was at an age - that I either figured something out for myself now or I would die a very miserable person. The only one thing I knew for sure is that I was really great with animals but too late to become a veterinarian in my opinion and for some reason I thought of grooming dogs. I researched the field to death and couldn't find a local school. My mother started looking into things for me knowing I needed to do something or I never would at my age. A week or two went by and my mother called me and wanted to take me out to check out a dog grooming school and meet the instructor/owner of this school. We arrived and I met Nancy and from that point on my life has completely changed. She told me that grooming dogs is very hard work yet of course my thoughts were 'How hard can it be?' She also told me that if I could handle the work and loved everything about being a dog groomer that she would put her heart and soul into teaching all she knows so I could finally make my own money and or run my own business and that alone would empower me as an independent woman and give me the self worth I needed and wanted so desperately. Well, I attended West Paw school of grooming and soaked in all Nancy had to offer and I not only am a certified pet groomer, I own my own business, set my own hours, pay my own bills and yes sit in traffic from time to time and I am loving life doing something I love to do and I am good at and that alone is so damn empowering Just one more thing though ... I am making damn good money honestly with my head held high. I am humble but also proud. Nancy was and is not only my instructor but a friend for life. I still call her for help and probably always will. She's got almost 30 years experience in the grooming industry so I will always be learning from her but most of all she is truly one of the most sincere, real, honest human beings I have ever met. She loves her students and takes great pride in teaching her skill to students and watching their lives change. I must admit I feel so lucky that my mom and I made the right choice when choosing West Paw as my school cause I am out in the real world now and I am a DAMN good pet stylist and proud of it. THANKYOU SO MUCH NANCY. I am alive and happy and yes I am EMPOWERED by you. P .S. to all... I got rid of that man and I make more money than he ever did. I am 43 Years old and had just hit a crossroad in my life. I wasn't happy at my job. Which I might add, was working for a major international parcel delivery company. But that's exactly what it was, a job. I was looking for something more fulfilling that I would love, and make it my career. They say; "If you could do something you love what would you do?" Animals! I just love all animals, they just come so naturally to me. Once my mind was made up my search for change began. After much research, I found West Paw through the internet. Spoke with Nancy and knew this was the place for me. Gave my job notice, and began grooming school right away. I learned so much and absorbed as much information as I could while I was learning. Before completing the course I already had a grooming position waiting for me. Dog grooming is a supplementary income for me by choice. It allows me such flexibility in a stress free environment. I am just so much happier in my life by making that decision for change earlier this year. I thank nancy and West Paw for making future dog grooming careers come true. I now look forward to going to work and making all the little critters look and feel better with my new skills, and to continue developing those skills more an more each day. I started this letter a number of times trying, but it is so hard to put into words how much West Paw, Nancy, and Anna have done, and come to mean to me personally. from the moment I walked through the door, nancy and Anna made me feel comfortable. Starting new things is not easy for me. I have a learning disability and sometimes this made it difficult for me to remember things. But Nancy and Anna went the extra mile for me. I know it is not always easy. Nancy even gave me an extension which I appreciated because this was something she did not have to do. I graduated and a week later Nancy called and I had an interview with another shop. I got a job! Then Nancy and Anna called to see how things were working out for me. This meant so much to me. Nancy really does care about the student and is very supportive. After graduation nancy really does like to hear from her ex-students. This makes Nancy and Anna and West Paw rare. Nancy is an artist, a master of her craft when she creates outside of the box; it is amazing to see! I feel blessed to have Nancy and Anna in my life and for going to West Paw. I know anyone who is looking for a school, and a career couldn't find a better choice than West Paw. Thank you, Nancy and Anna, for making dreams come true and changing lives. I was a grooming student at West Paw in April - July 2007. So at the age of 42 I took a chance in life and went for my dream. To be able to work with animals and learn how to groom and start my own business. I made the right choice and found a great grooming school in West Paw. Even though its been years since I've been in class, I'm able to call Nancy anytime and ask anything I might need advice on she has always been there to guide me in the right direction. And that's why West Paw was the right school for me. Hi, Nancy just wanted to say hi and to let you know I placed 3rd at SuperZoo:) I also opened my own business, you should check out my Dogs Gone Stylin page for photos of SuperZoo. Thanks for getting me started in the grooming industry, best job I have ever had!